Now you have to admit, I have been very well-behaved in terms of the bacon recipes lately. I didn’t put any bacon in the pumpkin granola, or the marshmallow frosted cupcakes, or even in the spaghetti tacos. I am practically going through bacon withdrawel over here. And the only antidote might be this CRAZILY good popcorn. 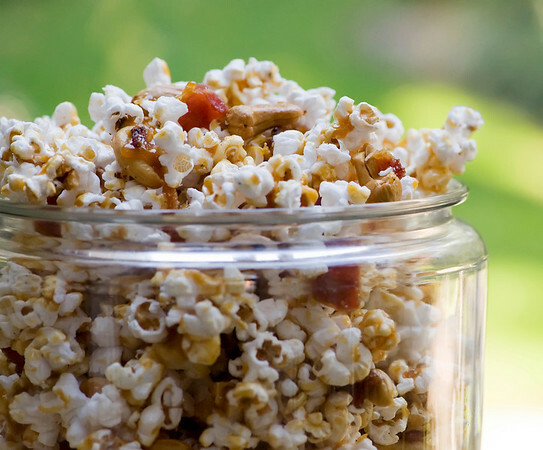 Bacon, cashews and popcorn, all held together with just a little bit of caramel and with a little red pepper tossed in just to keep you on your toes. It’s hard to describe how completely, totally, addictively good this is. All I will say is, one minute that jar was full up with popcorn, and the next it was empty. It’s all kind of a blur to me. A happy, sweet, salty blur. This recipe comes via the wonderful Saveur magazine (who called out my little blog as one of their “Sites We Love,” so I in turn will love them forever), and they got it from someplace in Denver called Colt and Gray. I had never heard of Colt and Gray before this recipe, but based on this popcorn recipe alone, I love them too. It’s part of their bar menu (don’t you just love bar menus???) and I could easily eat it for dinner all by itself. Here’s the deal. Pop up about 15 cups of popcorn (which is about 1/2 cup of unpopped popcorn kernels, which doesn’t make sense to me but it’s true.) This will mean your popcorn ends up with just a tiny bit of caramel on each kernel, which was perfect from my point of view, but if you like more caramel on your caramel corn, cut the popped popcorn down to 10 or 12 cups. Cook up some bacon, crumble it up and toss it in with the popcorn. Add in some cashews, some coarse salt and some red pepper. Now comes the fun part: making the caramel. You bring some cream to a boil with a tea bag, and let it sit for a while. (Tea bag? I don’t know, and I wasn’t going to ask any questions.) Then you boil up some sugar, water and corn syrup in a large saucepan until the sugar melts and turns amber-colored. Now comes the dramatic part: pour in the cream…it will bubble up and then before your eyes you will have a pan full of beautiful molten caramel. Quickly pour it over your popcorn mixture, quickly stir it up to coat everything with just a touch of caramel loveliness. Now turn the whole shebang onto a parchment lined cookie sheet and let it cool until the caramel hardens. Then comes the hardest part of all: trying not to eat it all in one fell swoop. Good luck with that part! Hubba hubba- what a recipe! I truly do commend you for not putting bacon in the pumpkin granola. because actually, that does sound kind of awesome now that I think about it. This popcorn looks amazing! definitely bar food worthy. but definitely also "it's thursday night and i want popcorn" worthy. Oh My!!! I'll definitely have to try this one! It's got tons of the flavors I love…! YUM! This sounds fabulous! I recently had dill pickle flavored popcorn and it was intense! Kate, Saveur magazine? That's awesome!!! I eat lots of popcorn to distract my boring days! good idea. .lol thanks! Looks delicious! I have yet to baconate anything, but this popcorn might just get me on the band wagon! What a great way to make my popcorn not good for me…haha :) Plus the addition of bacon is perfect! My kids always ask me to make some of this. They really like it! So delicious. Oh my. I'm afraid to make this even once because I truly think it'll be my downfall.